This new 6.5mm Creedmoor offering from Federal allows you to thrill the bullseye with scary accuracy that doesn't come at a horrific price. 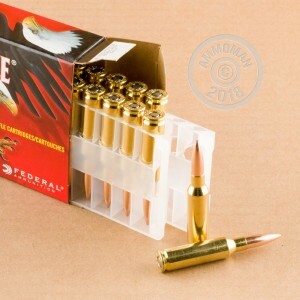 Federal Premium is one of the top ammunition manufacturers in the United States and has been building a reputation for consistent quality since 1922. 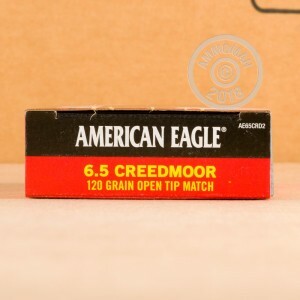 Thanks to their vast experience, their American Eagle line serves shooters with unwavering performance and domestic components which include non-corrosive Boxer primers, reloadable brass casings, and efficient propellant grains. Federal tops this 6.5 Creedmoor cartridge with a 120-grain projectile of pristine balance and uniform dimensions inside and out, granting it steady contact with barrel rifling for in-flight stability. This level of precision is made possible by the bullet's OTM (open-tip match) format: a copper-jacket is filled from the mouth with lead, ensuring a core with no gaps or bubbles and an ogive with no nicks or burrs. 120 grains is on the caliber's lighter side and matches tons of hunting and match options from Federal and other manufacturers for easily followed ballistics.